To develop a top-tier, world-class wrestling Center of Excellence, rooted in wrestling and leadership best practices, which enables elite athletes to compete and win championships at the highest levels of amateur competition. 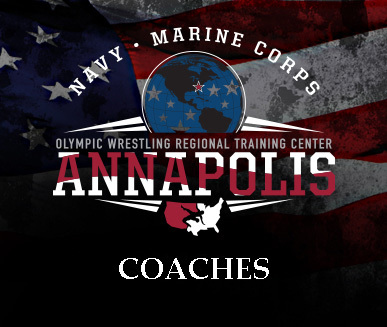 The Navy Marine Corps RTC is recognized by USA Wrestling as an Olympic Regional Training Center. It’s effort is to focus elite athletes who aspire to become All –American, National, World, and Olympic champions in a single training complex. This focus provides a location for local athletes and the individuals and corporations who choose to support this noble and worthy initiative to pursue excellence. The training complex is housed on the prestigious grounds of the United States Naval Academy. Currently a core group of 40+ athletes from every age group benefit from the training offered in freestyle wrestling, leadership development, and physical and moral courage. 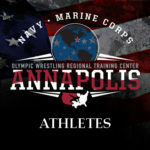 To create a peak performance competitive environment, in partnership with Navy Wrestling, where RTC athletes can train, compete, and win championships at the highest level of amateur competition. The NMRTC designates annual resources to support enhance local wrestling facilities, training equipment, staffing support and other requests from its participants. The NMRTC offers local athletes and coaches (250 miles as the crow flies) access to a designated USA Wrestling Recognized and Sanctioned Regional Training Center. The NMRTC enhances the resources offered to our community by implementing this unique training environment made possible by programming provided by USA Wrestling, the armature wrestling Olympic National Governing Body (NGB). The Regional Training Center model offers both coaches and athletes a competitive environment with exposure to premier age group athletes (high school), collegiate and senior level athletes and coaches. Weekly education is provided in all areas of development required to be a top competitor in the sport of armature wrestling; (Strength, Speed, Skill, Stamina, Agility, Mental and Moral Development). All key attributes sought after by athletes at every level, shared with and practiced by coaches who aspire to be become champions and help those most dedicated and talent to reach their full potential. To establish a highly competitive wrestling program at USNA; one that can win the EIWA Championship, regularly produce champions, and consistently place in the Top 20 in the NCAA Tournament.